Wait…just how many resurrections were there? The supreme killer text in the New Testament—the one that wipes out the story that Jesus rose from the dead—is a gift to us from the author of Matthew’s gospel. This is worth noting as Easter is upon us, but I wonder how many believers notice this text; or, for that matter, how many have done even a little due diligence on the gospel accounts of Easter morning. This is the point at which Christians should say, “Okay, that’s it, we’re outta here.” Matthew has dropped the biggest clue imaginable that the New Testament trades in superstition. In any other context this story would be laughed off as a macabre detail in a horror novel. But Matthew was pushing the idea that the resurrection of Jesus had magical properties; so he alone came up with the fantastic account of a swarm of dead bodies coming alive as a consequence: “See, it works!” I suppose we have to give him credit for being creative. But who would take this seriously, any more than we do the other famous resurrection fable found in John 11? If Matthew trades in superstition, the author of John’s gospel trades in bloated theology. The Raising of Lazarus is found only in John’s gospel—how in the world could the other gospels have missed this epic miracle?—because of that author’s superior talent for writing ponderous theology and passing it off as history. Superstition prevailed at the time, so Matthew and John wrote what was, literally, acceptable; without a doubt, they wrote what they believed themselves. Nor, after all, was resurrection anything new. “…we can confirm several other examples of clearly pre-Christian dying-and-rising gods well known across the Romans empire…” (Richard Carrier, On the Historicity of Jesus: Why We Might Have Reason for Doubt, pp. 170-171; see Carrier’s footnotes for details.) One of the favorite Christian dodges, when we point out incriminating Bible verses, is “You’re taking it out of context!” While in fact that is one of their failings; they do not see their religion in the context in which it arose; they are blind to the obvious borrowings. Aside from flat-earth Christians who’ve not picked up any knowledge of astronomy, no one believes that this happened, even under the pretext that “it’s a mystery.” This is religious fantasy, in league with superstition and magical thinking. Even those who resort to “it’s a metaphor” cannot escape the inconvenient truth that the body of the newly alive Jesus never left planet earth. Which can only mean—even for those who believe that Jesus rose from the dead—that he must have died again, and was buried again. How come the New Testament doesn’t tell us this? Isn’t this what we would call a cover-up? On so many grounds we’re super skeptical about Jesus coming back to life, but, in any case, the ‘miracle of the resurrection’ didn’t last all that long. 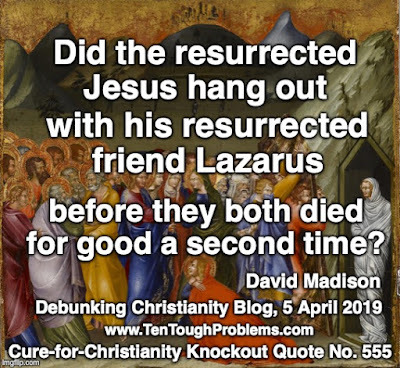 I wonder: Did the resurrected Jesus hang out with his resurrected friend Lazarus before they both died for good a second time? Just a few days ago, a Christian left a warning on the Facebook page for my book, “Don’t listen to this apostate.” Protection of the faith would seem to depend, in large measure, on not listening. And not tuning in. For so many centuries the resurrection of Jesus was celebrated and touted as proof of the faith, but when serious thinkers, unencumbered by faith bias, did the analysis, the credibility of these gospel stories was shattered. How many ordinary believers, moreover, who study the stories carefully and critically, realize that they don’t make sense? There’s also the 490-page volume, The Empty Tomb: Jesus Beyond the Grave (2005, edited by Price and Lowder), with footnoting to die for, and a 16-page bibliography. All of these works address the vigorous Christian apologetic campaign to ‘prove’ that the resurrection must have happened, had to have happened, our-faith-will-die if it didn’t happen. “We have signed, sworn testimonies of the very eyewitnesses claiming to have seen the magic performed—again, not as it was repeated and relayed for decades to unknown others, but from the eyewitnesses themselves immediately after it occurred. We even have whole volumes written by witnesses to the trials such as Cotton Mather and John Hale. How much evidence do we have? Enough to fill a truck. Let it be noted as well that none of the gospels describe the resurrection itself. That he had risen was inferred, because the tomb was empty—that story itself is dubious—and because angelic figures, in script invented by the gospel authors, said that it had happened. Could the case be any flimsier? After Easter Sunday service last year, a friend reported that the pastor had read Paul’s report in I Corinthians 15:6 that the Risen Jesus “was seen by over five hundred brethren at once…” Isn’t that exhilarating—so he seemed to think: what more could you want? I asked him how Paul could have known that. Did Paul have documentation for the event, which would have been some twenty years in the past? Had hundreds of people been interviewed? Here too, McCormick’s warning comes to mind: “…lacking in any recorded attempt at soundly principled inquiry.” Since Paul was given to hallucinations, we can’t just take him at his word. Would it have been convincing if Paul had reported that 500 people had seen a faith healer restore an amputated leg? Where did the gospel writers get their stories? We suspect, above all, from their imaginations, based so often on supposed hints about Jesus in the Old Testament. The great enterprise of apologists is to deflect attention from our ignorance of the story sources, and defend each component of the Easter/Resurrection story as possible, plausible, e.g., the Empty Tomb and Joseph of Arimathea. Then gerrymander a perfect fit to ‘prove’ that the resurrection was real (just forget about all those other bodies that emerged from their tombs, just forget that the body of Jesus had nowhere to go but back in the ground). “…if apologists like William Lane Craig can get an opponent as far as admitting that Joseph of Arimathea probably did have Jesus interred in his own tomb, and if the women probably did visit the tomb, and that the tomb was probably found to be empty, he can then press on to the conclusion that, Bingo! Jesus must have risen from the dead! Unless the author of the ancient narrative has revealed his sources: where did he get the story? 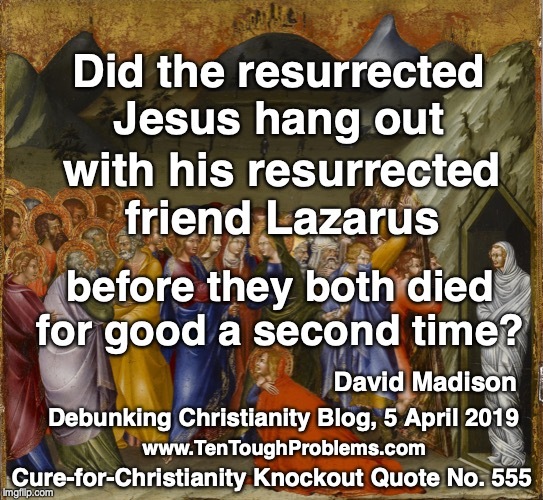 Especially an episode like the Raising of Lazarus. John alone tells this story, and without knowing its provenance, it cannot be classified as history. And as is the case with countless other similar episodes, there are so many obvious markers of religious fantasy literature; the gospels are theological novels. When Neil Armstrong landed on the Moon in 1969—with the whole world following the saga on TV for days—President Nixon proclaimed that it was “greatest week in human history.” Billy Graham knew better, of course, and corrected the president: Holy Week—that great celebration of magical thinking—still held that distinction. Hence it is of no use whatever to advance scientific arguments against resurrection. It’s a miracle; there are no scientific arguments that matter. So we urge the faithful to pick up their Bibles and see what’s really there—and what isn’t. If nothing else, verse-by-verse carefully pick through the four accounts of Easter morning at the Empty Tomb. Oh dear, how did it become such a jumble? We savor the rich irony that we don’t have to turn to science: the Bible itself provides ample evidence that “He is risen!” has been falsified. David Madison was a pastor in the Methodist Church for nine years, and has a PhD in Biblical Studies from Boston University. His book, Ten Tough Problems in Christian Thought and Belief: a Minister-Turned-Atheist Shows Why You Should Ditch the Faith, was reissued last year by Tellectual Press with a new Foreword by John Loftus. The Cure-for-Christianity Library© is here.